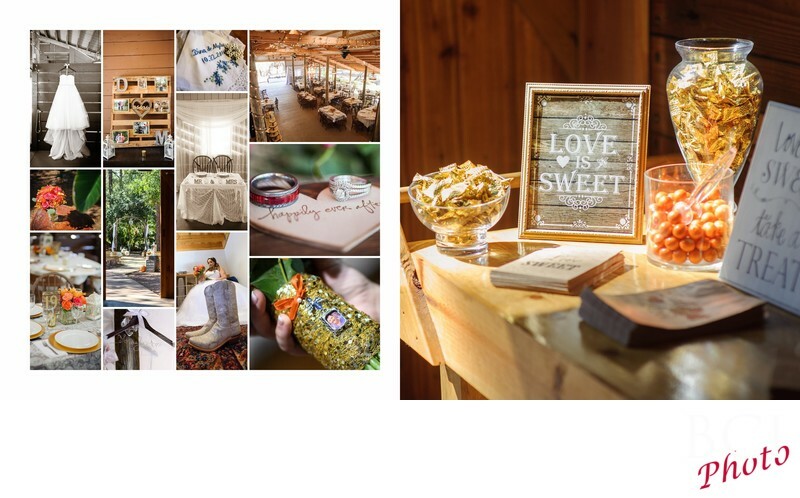 One of the things we love to do with our wedding album designs, is to layer the images such that one feature image becomes the feature image and smaller highlight images are placed around it. In that way, we direct the eye through the page much the same way that a film maker directs your attention thru quick cutaway shots to various details all tying into the same theme. Here you can also see what a fantastic wedding venue the Cielo Blu Barn really is. With its rustic charm the possibilities are endless in creating your favorite theme and decorating ideas abound.